We’ve just dropped anchor around these waters and here tell of a precious cargo that has departed from a recent shipwreck. Word is it contains a bountiful booty of lip smacking grog made of the finest Caribbean riches even an ol’ landlubber would enjoy! Ok don’t be fooled, we’ve not been taken over by a bunch of peg legged bandits riding around on big canons, we have however turned rather piratey over here. It doesn’t take much for that to happen because who doesn’t love to wear an eye patch and a bandana every now and then. That look is never going out of style! So it’s time to show some appreciation for some of the coolest looking people in history and enjoy some of the pirates of the Caribbean rum. 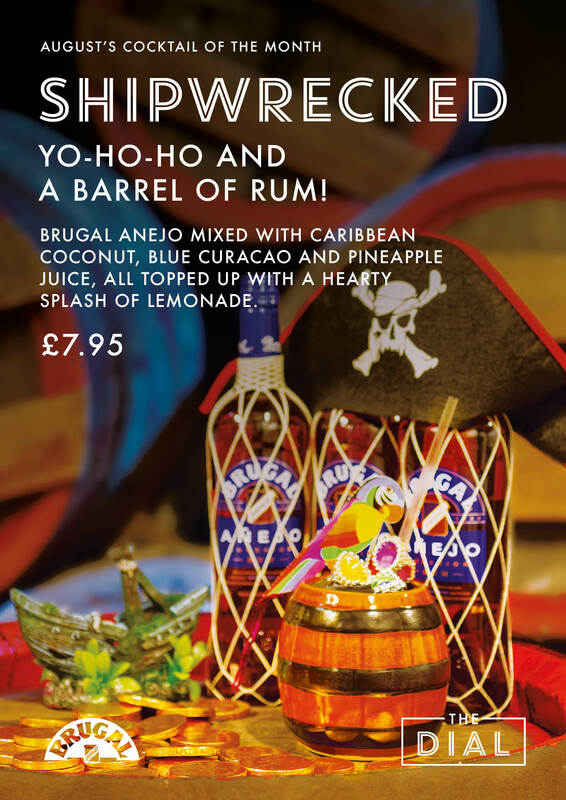 In all seriousness we’ve found an ancient shipwrecked cargo (not being serious at all) and turned a pirate’s barrel of loot into a mast raising Cocktail of the Month. This time we are using the five year mature Brugal Anejo as a smooth base and mixed it with totally tropical ingredients such as coconut, pineapple and lemon(ade), all shaken with triple sec and blue curacao. Well of course you do beard face, not only does this good ol’ grog come in a barrel, it also comes with shiny pirate coins, a fetching eye patch, diamond rings and a parrot that may or may not talk! (It wont). So, for treasure chests, long voyages across the sea and timbers that shiver, buy a boat! For drinks that make ye shout YO-HO-HO, set sail for The Dial. Rory Martin – bandana wearing beard face and Mixologist at the Dial.